Chatbot marketing may seem complicated at first, but due to the emergence of chatbot platform tools, creating and distributing a chatbot on your website and messaging apps is now easier than ever. 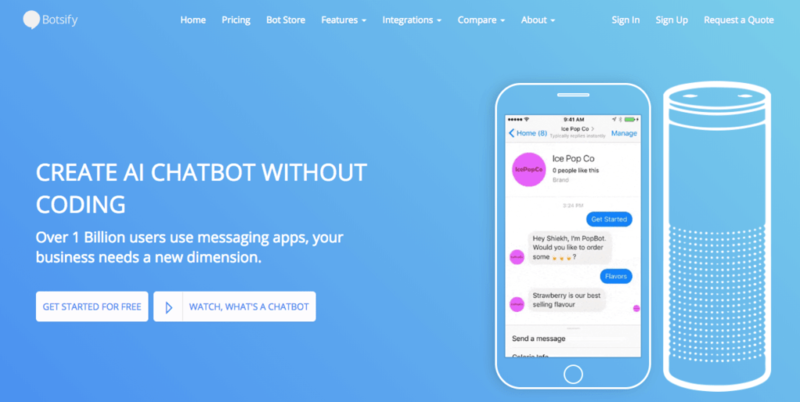 In this article, we’ll look at the top 8 chatbot platform tools that you can use to build your very own chatbot and supercharge your marketing. MobileMonkey is a popular Facebook messenger platform that lets you build chatbots on FB messenger, grow your contact list, segment your audience, and even build messenger funnels (an alternative to landing pages) that opt people into audiences when they click on the ad. The chatbots created via MobileMonkey can be programmed to make appointments, answer FAQs, track purchases, and use A.I. to match content to intent via keywords and interactions. The company was founded by leading internet marketer, Larry Kim. The MobileMonkey free plan provides everything you need to design and deploy successful messenger marketing campaigns that will drive real results for your business. It includes features such as a chatbot builder, messenger ads, chat blaster, Q&A triggers, and more. For advanced features like drip campaigns, bot analytics, and integrations, you’ll need to upgrade to any of the paid plans. To create your free MobileMonkey account, click here. To learn more about MobileMonkey and its key features, please check out my in-depth review of MobileMonkey here. Founded in 2015 by Vinit Agrawal and Ish Jindal, TARS enables individuals and businesses to create chatbots that can be used on your website and Facebook Messenger with no programming knowledge at all. The chatbots created via TARS can be used for ordering/booking process, feedback collection, conducting surveys, user onboarding, training, customer support automation, and a lot more. TARS doesn’t offer a free plan, but you can sign up for a 14-day free trial to create a bot and test out some of the bot-building features. 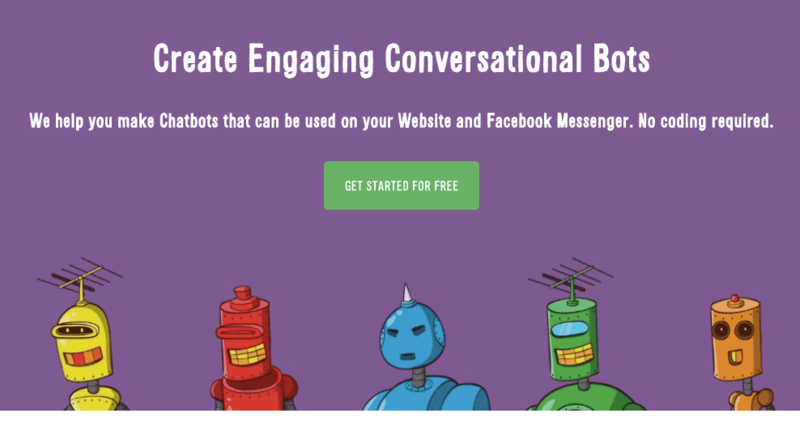 Botsify lets you create AI chatbots on your website or Facebook messenger without any coding knowledge. Botsify is integrated with several services, including WordPress, Shopify, Slack, Alexa, Google Sheets, RSS Feed, JSON API, ZenDesk. The easy-to-use drag and drop interface helps you with template design for your chatbot. Lots of big brands use Botsify to design their chatbots, including Apple and Shazam. You can find examples of bots created via Bostify at their bot store. 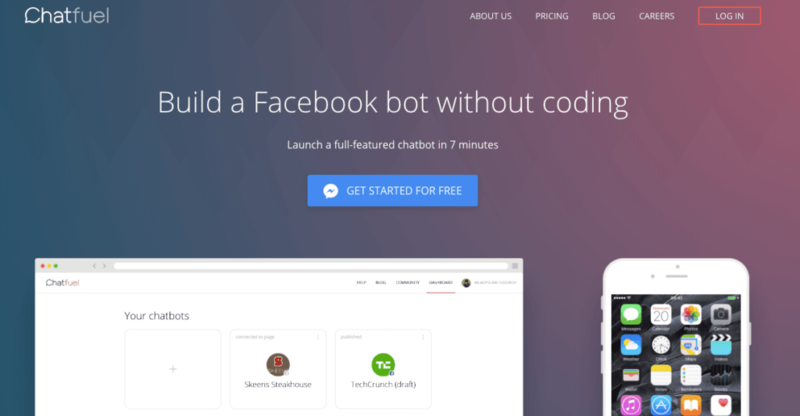 Chatfuel is a free bot-building platform that lets you create chatbots on FB messenger and Telegram with no prior coding experience required. Chatfuel is currently being used by NFL and NBA teams, and publishers like TechCrunch and Forbes. The main feature of the Pro Plan at this time is the ability to remove Chatfuel’s branding from your bot’s menu. Also available is the ‘People’ tab, which gives you more flexibility in managing your bot’s audience. Pro users also enjoy prioritized email support. If you’re in the eCommerce space and would like to learn more about how to build your own eCommerce chatbots, Chatfuel recently teamed up with Sumo to publish a mammoth guide on eCommerce Chatbots. Click here to check it out! Flow XO is a chatbot platform that allows you to build and distribute smart chatbots on Facebook and your website. The platform provides lots of pre-built chatbot templates which you can customize easily with the drag and drop editor. ManyChat lets you create a Facebook Messenger bot for marketing, sales and support. With ManyChat’s visual drag and drop builder, you can easily set up your FB messenger bot without any programming knowledge required. Pro accounts are billed based on the number of active subscribers. ManyChat automatically selects a tier based on a number of your subscribers. Wit.ai is a free chatbot software that lets you easily create text or voice based bots on your preferred messaging platform. Wit.ai learns human language from every interaction, and leverages the community: what’s learned is shared across developers. To see how a Wit.ai chatbot works, check out their demo app here. Wit.ai is a free chatbot platform. 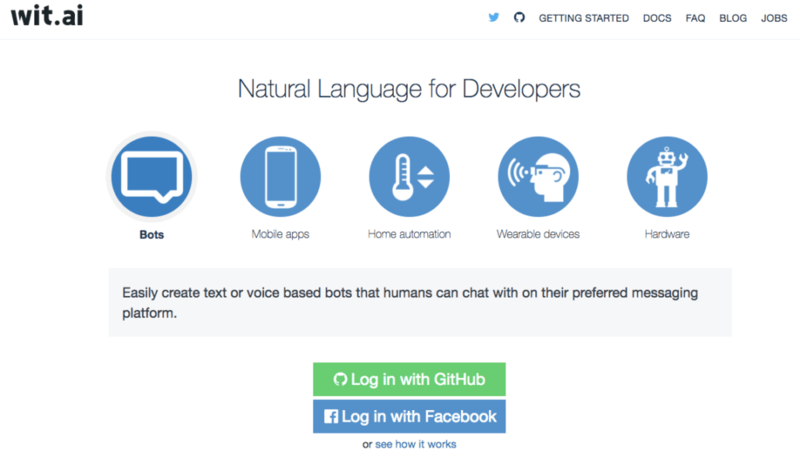 You can create a Wit.ai account by logging in via GitHub or Facebook. Once you’ve done that, you can create your first chatbot using Wit.ai’s chatbot building platform. To see how it works, click here. BotKit is a leading developer tool for building chatbots, apps and custom integrations for major messaging platforms. BotKit has an open community on Slack with over 7000 developers from all facets of the bot-building world, including the BotKit team. To get your invite to join the community, click here. So these are the 8 bot-building platforms you can leverage to build your own chatbots to interact with your prospects and customers. There will be more chatbot platform tools emerging very soon and with HubSpot’s acquisition of Motion AI, it’s only a matter of time before the big players jump on the chatbot bandwagon. But for now, these are the top 8 chatbot building tools you can rely on to build chatbots for your business. Hope you found this article useful. Please share it on Twitter using the link below and share on other social channels using the social bar on the left. Hi Sandeep! Terrific article. Lots of good information here about chatbot platforms. I have another terrific multichannel chatbot platform I would like you to check out and maybe add to your list. I have included my email address for us to discuss further. Thank you and have a great day!